It's an end of an era. 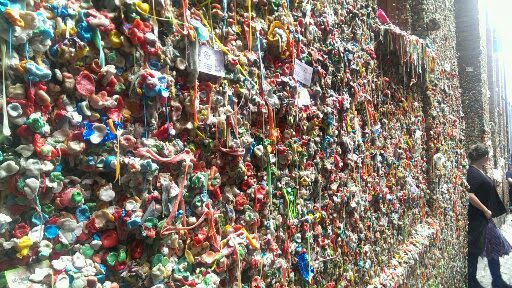 The Gum Wall at Seattle's Pike Place Market is scheduled to get a steam cleaning. No more gum. When I relayed this information to people there were very mixed responses. Some people said "Awww. That's too bad." Other people I talked to said, "Good! That is so gross". For me "gross" can be found just up the steps from this alley way where the fishmongers are flinging fresh fish across the market and catching them with the style and grace of a Seattle Seahawks receiver. Check out this video of Miss Rodeo Washington 2015 catching a flying fish. (of course it helps that in her free time she likes to go fly fishing). 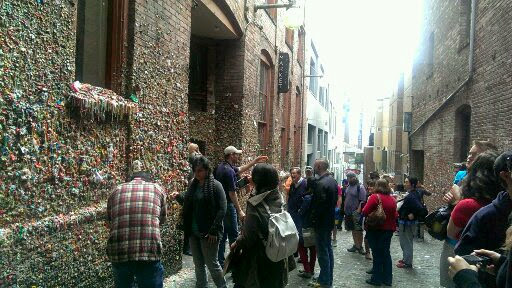 There is a Wikipedia page dedicated to the gum wall in Seattle explaining that this "attraction" started in approximately 1993. For nearly 20 years people have been visiting this little alley way on the south side of Pike Place Market and leaving a little souvenir and taking with them a silly memory. 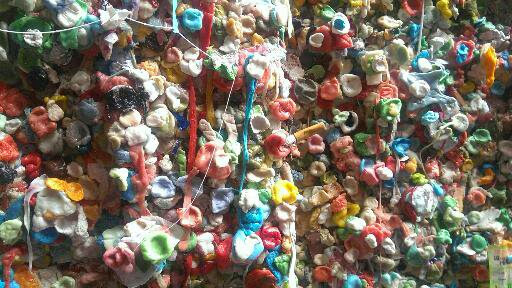 The process of cleaning the wall is apparently essential because of the sugar in the gum that is eating away at the brick. It is not clear how long this process will take to restore the alleyway to it's pristine (yet still a little shady) state. But don't worry if you have missed this very gooey site. The city has assured fans that they will be allowed to begin leaving their masticated masses of confectionary blobs after the cleaning process is complete. I have always enjoyed walking through this alley and looking at all the different colors of gum stuck on these beautiful old brick walls. 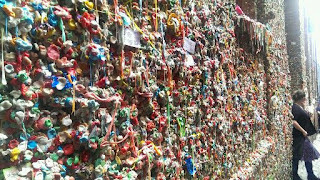 With every wad of gum there is a story and a person that had walked through the alley before me. I wonder about their stories and their giggles as they placed their tribute to this urban artwork.